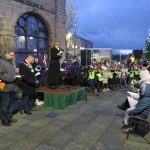 Warwick Mayor Cllr Richard Eddy and Rotary Club President David Smith welcomed about two hundred people on Sunday to a service of dedication in Warwick Market Square for the Lights of Love on the town Christmas tree. 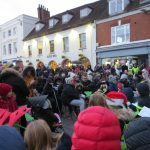 Warwick Community Band provided the music and children from Newburgh Primary school accompanied them for a short carol service led by Rev. Jonathan Hearn, Vicar of St Pauls, and Town Clerk Jayne Topham made a reading. Fortunately, the rain held off and as the sun set the lights on the Christmas tree were turned on. The tree donated by Barn Close Nurseries, is now covered with cards donated by people remembering loved ones and will be left up until the New Year. Proceeds will be shared between the Mayor’s charities and Myton Hospice. Names of those remembered on the tree are shown next to the tree, and on the Warwick Rotary website.